The year is drawing to a close, and the snow is falling, but the friday fun is just heatin’ up. Our first guest is none other than Ben Heck from element14’s wildly popular engineering television series “The Ben Heck Show”. Ben gives us an exclusive preview of the next season of “The Ben Heck Show” and lets us in on how he got into this crazy business. Also this week, author Ray Salemi is here to light our way to a special place called UVM land. He’s written a new book called “The UVM Primer: A Step-by-Step Introduction to the Universal Verification Methodology” and he’s here to break UVM down into its geeky bits and pieces. 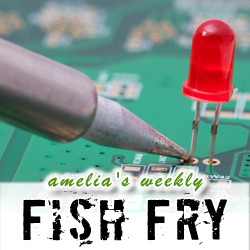 Finally, we close up this week’s Fish Fry with a discussion about some innovative open source plans that could bring 3D metal printing right to your work bench. Saddle up, my friends, the fun is about to begin!